Introduction: With the rising number of bariatric surgeries performed in the United States the surgical and Gastroenterological teams are face with an increased number of complications. Reoperations for complications after bariatric surgery are associated with high morbidity and mortality. Laparoscopic sleeve gastrectomy (LSG) postoperative complications are mainly represented by gastric fistula with an occurrence rate of 0% to 5.1%. This complication is difficult to manage and requires multiple radiological, endoscopic, and surgical procedures. Case: We report the case of a 42 year-old morbidly obese man who underwent Laparoscopic Gastric Band placement in outside institution complicated with band erosion. At that time, the band was removed and a LSG was performed. The patient subsequently developed a gastric leak and abscess formation managed with percutaneous drainage, IV antibiotics and TPN but over the course of several months this developed into a large gastrocutaneous fistula that drained out of his left chest wall. After failure of conservative management, this patient was referred to our institution in surgical consultation for endoscopic management of this complex fistula. The patient underwent upper endoscopy that showed a 2 cm opening consistent with gastric fistula tract; this was large enough that allowed entrance of an adult-sized upper endoscope into a very large fibrotic cavity. The mucosa in the entrance was fulgurated with cautery and then fibrin glue was injected into the cavity with subsequent placement of endoscopic clips. At this point a 23-mm diameter flange and 12 cm in length WallFlex® Partially Covered Esophageal Stent was advanced over the Savary guidewire under fluoroscopic guidance and deployed to correlate with the clips at the level where the fistula tract was. Post procedure the patient was kept NPO for 2 weeks and then was started on diet without further evidence of drainage from fistula skin site. 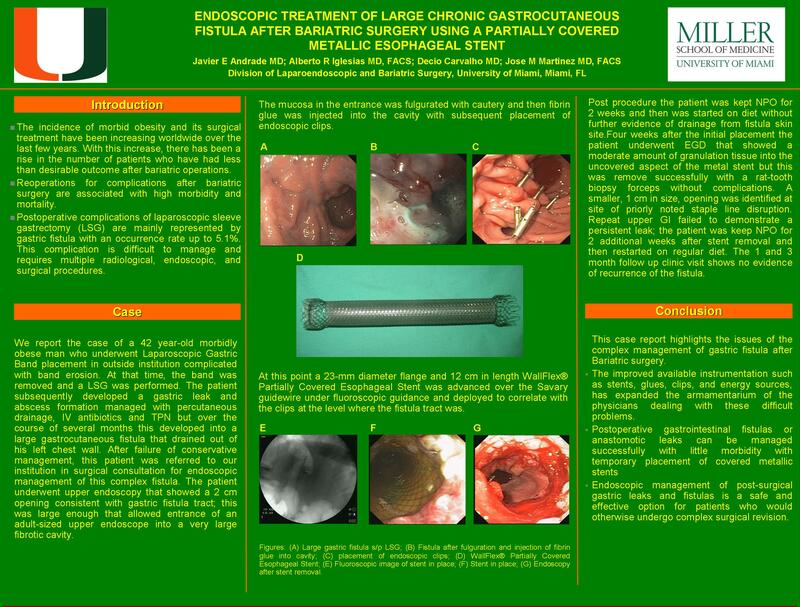 Four weeks after the initial placement the patient underwent ERCP that showed a moderate amount of granulation tissue into the uncovered aspect of the metal stent but this was remove successfully with a rat-tooth biopsy forceps without complications. A smaller, 1 cm in size, opening was identified at site of priorly noted staple line disruption but this was not explored to not further traumatize this area. The patient was kept NPO for 2 additional weeks after stent removal and then restarted on regular diet. The 1 and 3 month follow up clinic visit shows no evidence of recurrence of the fistula. Conclusions: This case report highlights the issues of the complex management of gastric fistula after Bariatric surgery. Postoperative gastrointestinal fistulas or anastomotic leaks can be managed successfully with little morbidity with temporary placement of partially covered metallic stents avoiding repetitive major surgery and its associated risks.